This is the little space I’ve designated as a “dining area” in my apartment. I’m really getting into decorating now that I’ve got a place of my own and I’ve been pleasantly surprised by the things I have found so far. So as I go about this gigantic project of decorating my apartment (it’s rather large for just me but I love it) I thought I might blog about my findings and share my go-to places for decor. Breakfast at Tiffany’s poster – $5 Office Max like 5 years ago. Walmart may not have much to offer in the home goods section of your local store, but online they have an amazing selection! Pinterest is always a wonderful tool for ideas and inspiration but I’ve found that until I had a clear idea of what theme or style I wanted, Pinterest just kept adding too many other ideas into the mix. Ideas of stuff other people like and had deemed stylish. Not necessarily “my style.” So I came across a website/blog “The Everygirl” and started following their Instagram account as well as some of their editors. From there, I picked up on other places and people to follow on Instagram and Pinterest. I started to take note of the things that really stuck out and then went back to Pinterest searches for very specific things. Which lead me to Etsy, where I was able to purchase some of the exacts items I fell in love with on Pinterest! Beyond that, I’ve started going to flea markets and antique stores, dollar stores, places like TJ Maxx and Tuesday Morning. Hoping to post more apartment photos and details soon! 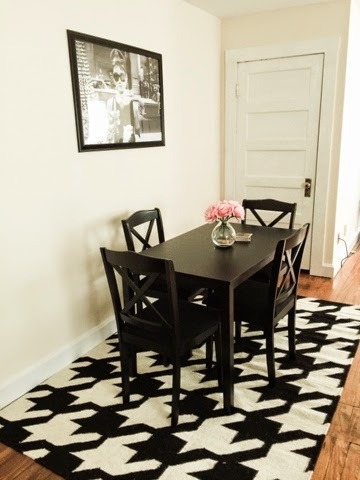 Leave a comment if you’d like the full description of the table and chairs or rug to order!